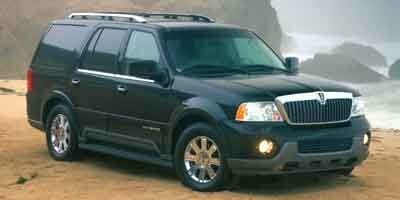 Description Win a bargain on this 2003 Lincoln Navigator Ultimate before someone else snatches it. Roomy but agile, its tried-and-true Automatic transmission and its durable Gas V8 5.4L/330 engine have lots of zip for an inexpensive price. It is stocked with these options: Variable assist pwr rack & pinion steering, Underbody-mounted full-size spare tire w/steel wheel, crank down feature & jack, Timed accessory delay for pwr windows, radio, Tilt steering wheel w/leather/wood trim, speed/radio/climate controls, Speed-sensitive intermittent front wipers w/(3) washers, Speed control, Solar tinted front glass, Soft-touch instrument panel w/authentic wood applique, pwr point w/cover, satin nickel accents, Soft-touch door trim panels w/authentic wood appliques, armrest, speaker grille, map pockets, chrome door handle, and Side impact door beams. You've done your research, so stop by Lakeland Toyota at 2925 Mall Hill Dr, Lakeland, FL 33810 soon to get a deal that no one can beat!